Department of Transportation (DOT) is responsible for planning, designing, constructing, operating, and maintaining State facilities and infrastructures in all modes of transportation (land, air, and water). To achieve these objectives, the Department coordinates with other State, County, Federal, and private agencies and programs. The DOT was formed shortly after Hawaii became a state in 1959. We have three modal Divisions (Airports, Harbors, and Highways) and a Support Services or Administration Division. The four Divisions are headed by their respective Deputy Director. The DOT currently provides, operates, and maintains eleven (11) commercial service airports; four (4) general aviation airports; ten (10) commercial harbors; and two thousand four hundred fifty (2,450) lane miles of highway. Four of the five major airports now serve domestic overseas carriers. We have transportation facilities and infrastructure on all of the six major islands. The DOT is composed of four principle sub-programs: Air Transportation Facilities and Services; Water Transportation Facilities and Services; Land Transportation Facilities and Services; and Overall Program Support for Transportation Facilities and Services. These four sub-programs represent approximately 35 separate lower-level programs and plans that we have to manage and budget for. The three modal Divisions work closely with their Federal counterparts: the Federal Aviation Administration, the U.S. Coast Guard, and the Federal Highways Administration, in order to keep Hawaii coordinated with overall U.S. standards. On the local level, the Counties’ transportation systems must complement the State system. Therefore, the Counties’ Planning Commission and the Counties’ Department of Public Works assist us in determining their needs and priorities of transportation facilities. In addition, the City and County of Honolulu performs maintenance activities on all traffic lights on Oahu and provides an abandoned vehicle removal service from State highways on the island of Oahu. The DOT is required by law to generate its own monies to fund its programs and projects. Independent special funds were established for each of the three Division’s major programs. Each fund is expected to generate enough revenue to pay for the programs’ operation and maintenance costs and to contribute a fee to the State General Fund for central services. This fee is set at five percent of each special fund’s gross revenues after debt service. These special funds must also provide a higher level of cash financing in the Capital Improvement Program to ease the burden on debt service. Since the Capital Improvement Program is large, the DOT continues to rely on reimbursable General Obligation Bonds and federal aid (largely through the U.S. Department of Transportation) to help fund our programs and projects. The Airport Revenue Fund was created under Section 248-8, Hawaii Revised Statutes. Its primary revenue sources are the aviation fuel tax, landing fees, airport use charges, concession fees, and investment income. Other revenue sources include rentals and miscellaneous earnings. The Harbor Special Fund was established under Section 266-19, Hawaii Revised Statutes. The majority of the fund’s revenues comes from fees and charges for profiles, dockage, demurrage, and the rental of land and wharf space at the state’s commercial harbors. The remaining amount is generated from various service charges, permits, and licenses. The State Highway Fund was established under Section 248-8, Hawaii Revised Statutes. The principal sources of revenue are taxes or fees relating to liquid fuel, vehicle registration, motor vehicle weight, rental motor vehicle surcharge, tour vehicle surcharge, and periodic motor vehicle inspections (safety). 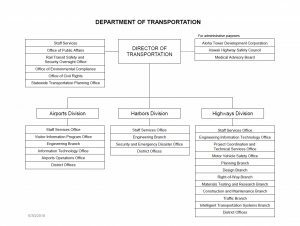 Organizationally, DOT Director oversees the Special Assistant, the Public Affairs Office, the Office of Special Compliance Programs, the Office of Civil Rights, and the Statewide Transportation Planning Office. However, functionally, the Office of Special Compliance Programs, the Office of Civil Rights, and the Statewide Transportation Planning Office are considered part of the Support Services Division and supervised by the Deputy Director for the Support Services Division. The Highway Safety Council, and the Medical Advisory Board are agencies attached to the DOT for administrative purposes. The Commission on Transportation (COT) advises the DOT Director on matters within the jurisdiction of the DOT. Section 26-19, Hawaii Revised Statutes. The Highway Safety Council advises the Governor on matters relating to the programs and activities within the State in the field of highway safety. Section 286-5, Hawaii Revised Statutes. The Medical Advisory Board develops and maintains a system for medically evaluating persons who an examiner of drivers has reason to believe have mental or physical conditions that might impair their driving ability. The Medical Advisory Board also advises the examiner of drivers regarding medical criteria and vision standards for motor vehicle drivers. Section 286-4.1, Hawaii Revised Statutes. 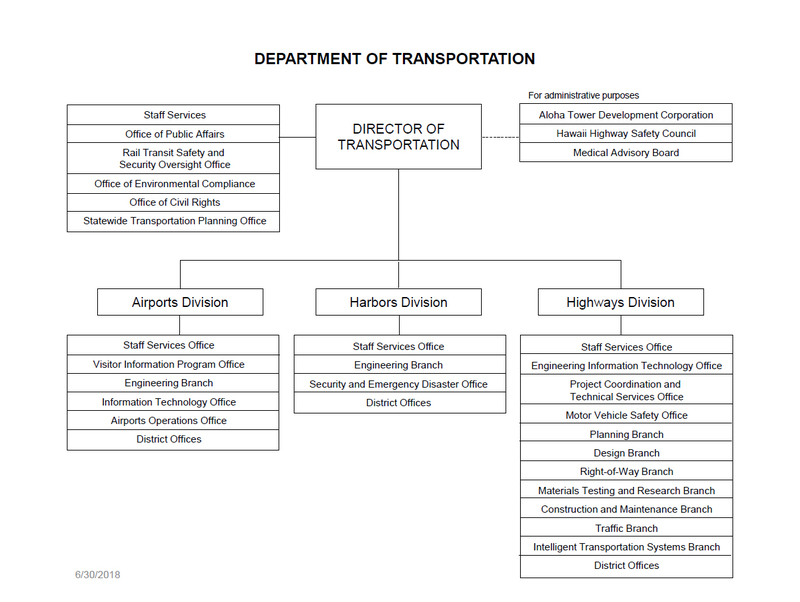 In addition to the Highways, Airports, and Harbors Divisions, the Department of Transportation (DOT) has a Support Services or Administration Division. This fourth Division is also headed by a Deputy Director. The Support Services Division consists of the following eight (8) offices: 1) our Statewide Transportation Planning Office (STP); 2) our Office of Civil Rights (OCR); 3) our Office of Special Compliance Programs (DIR-CZ); 4) our Personnel Office (PER); 5) our Contracts Office (CON); 6) our Computer Systems and Services Office (CSS); 7) our Business Management Office (BUS); and 8) our Planning, Programming, and Budgeting Office (PPB). Basically, the Support Services Division supports the other three Divisions by providing overall coordination on matters that affect more than one Division, by providing a uniform review on matters that affect all Divisions, or by providing a special or unique service to the other Divisions. Our Mission is to make the other Divisions SUCCEED. STP coordinates DOT’s multi-modal transportation planning programs. Working closely with DOT’s Airport, Harbors, and Highways Planning Offices, the Oahu Metropolitan Planning Organization (OMPO), the city/county planning departments, the U.S. DOT Federal Highways Administration, and the Federal Transit Administration; STP develops and maintains the statewide transportation planning process. STP ensures that these plans are comprehensive, integrated, and publicly accountable. For example, the Statewide Transportation Plan encompasses Hawaii’s entire transportation infrastructure, which is essential for delivering critical commodities to us from overseas, inter-island, and intra-island transports.STP also administers the Federal Transit Administration’s capital assistance program for mass transit, the elderly, and persons with disabilities. It is the policy of DOT to be in compliance with the Civil Rights Act of 1964 and all other applicable civil rights laws and statutes. Some of these civil rights laws and statutes were enacted to protect and benefit our employees; others were enacted to protect and benefit non-employees, such as members of the public or general and sub contractors. OCR administers DOT’s comprehensive civil rights program, which includes Title VI and Title VII of the Civil Rights Act of 1964, the Disadvantaged Business Enterprise (DBE), and the Americans with Disabilities Act of 1990 (ADA). DIR-CZ administers our Environmental Compliance Program and our Hazardous Materials Program. The Environmental Compliance Program ensures our compliance with environmental regulations, including the Resource Conservation and Recovery Act, the Clean Air Act, the Clean Water Act, and their state counterparts. The Hazardous Materials Program administers the regulations relating to the transporting of hazardous materials through areas under DOT’s control. The Departmental Personnel Office administers the Department’s comprehensive personnel management program, which includes the civil service system and the provisions of collective bargaining. PER also provides direction and assistance in the various functional areas of the program, such as in recruitment, training, and the administration of employee benefit programs. CON is responsible for overseeing the procurement and award of goods, services, and construction and for advising the Department to be in compliance with Hawaii’s Procurement Code. CSS is responsible for providing full Information Technology (IT) services to the Department and for coordinating these services with the Divisions’ IT offices. For example, CSS manages and operates the Department’s data center as well as the Department’s department-wide and statewide telecommunications. BUS is responsible for providing services in the areas of financial management, accounting, account internal control, systems accounting, and office service work. BUS also coordinates these services with the Divisions’ Administrative Services Office. PPB administers DOT’s planning, programming, and budgeting activities, as mandated by the Executive Budget Act. This requires PPB to develop and maintain a system of budgetary execution and control procedures. PPB also analyzes and conducts studies to determine the efficacy of our programs, methods, and procedures.